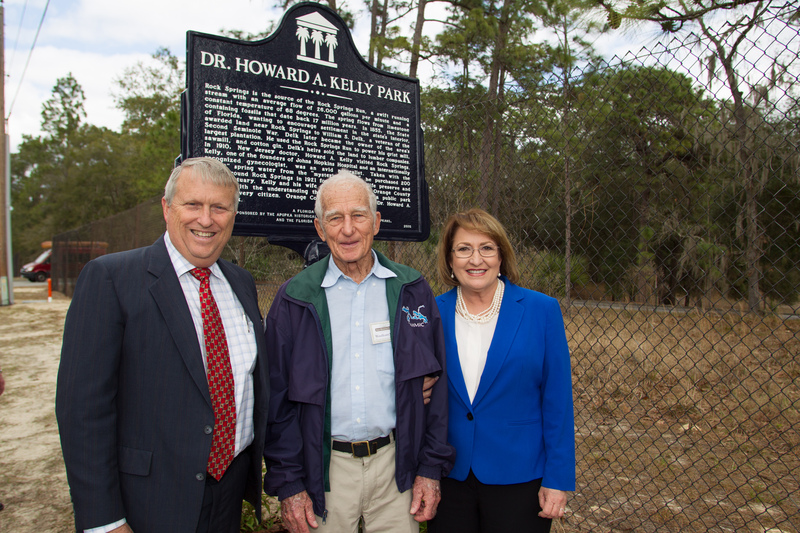 Orange County Mayor Teresa Jacobs and District 2 Commissioner Bryan Nelson recently joined Apopka Mayor Joe Kilsheimer and members of the Apopka Historical Society to celebrate the historical marking of Kelly Park, which is located in Apopka, one-quarter mile east of County Road 435. In 1927, Dr. Howard A. Kelly, who was a prominent physician in Baltimore, generously donated 260 acres of property to Orange County. The land was steeped in history reaching back to the Timucua Indians and Dr. Kelly stipulated that “it be held as a preserve,” a sanctuary of wildlife and woodlands. His generous donation came to exemplify his deep concern for the preservation of Florida’s natural spaces. “It’s fitting that Dr. Howard A. Kelly Park – the second oldest of Orange County’s parks after Warren Park – be recognized as an important historic location,” said Matt Suedmeyer, Orange County Parks manager. “In the park’s 89-year history, millions of visitors have sought it out.” The Apopka Historical Society dug into the history of the park and applied for the marker. On hand to help unveil the historic marker was William Woollcott Kelly, grandson of Dr. Kelly. He explained that his grandfather was drawn to Florida by the variety of flora and fauna found here and he spent much time exploring the land and collecting. A friend in Eustis, B. Martin Kinser, introduced Dr. Kelly to Rock Springs around 1921 and the property was about to be sold by a lumber company to a buyer intending to mine the limestone for road construction. Dr. Kelly bought the property “to save it from improvement” and decided to give it to Orange County in 1927 so more people could enjoy it. The original donation of 260 acres has expanded over the years with the acquisition of surrounding property, including Camp Joy. Dr. Howard A. Kelly was born in Camden, NJ, and was always intrigued with nature. Later in life, he grew up to become the first professor of gynecology and obstetrics at Johns Hopkins University as well as a gynecological surgeon at Johns Hopkins Hospital. Kelly was a successful man who achieved many accomplishments, including starting the Kelly Clinic in Baltimore and inventing the cystoscope. It was in 1910 that Kelly fell in love with the atmosphere of Rock Springs, and he eventually bought the land in 1921 for a wildlife preserve and bird sanctuary. On May 12, 2017, Kelly Park will celebrate its 90th anniversary as part of Orange County’s Park system. “Dr. Kelly was a wonderful environmentalist and philanthropist who made Kelly Park one of the most captivating County parks in the state of Florida,” Commissioner Nelson said. The focal point of the park remains the free-flowing natural spring with a year-round constant temperature of 68 degrees Fahrenheit. Visitors can rent tubes outside the park and float downstream for 15 minutes for three-quarters of a mile, then walk the path back and go again. The park also features tent and RV camping, a full-service concession stand, picnic pavilions, grills, a playground, and restrooms. View photos from the dedication ceremony on Mayor Jacobs’ Flickr album.